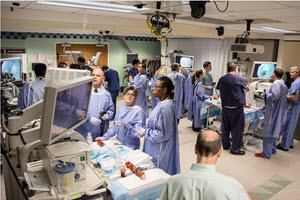 On Wednesday, June 18, 2014, WISER hosted the hands-on component of UPMC's "2014 Minimally Invasive Approaches to the Management of Achalasia and Other Benign Esophageal Disorders" course for cardiac and thoracic surgeons from many different hospitals. During this workshop, participants reviewed and practiced state-of-the-art procedures like the Per-Oral Endoscopic Myotomy (POEM) procedure, as well as having the opportunity to practice on the LINX Reflux Management System. The workshop consisted of 10 stations for POEM and 2 stations dedicated to the LINX procedure. The didactic portion of the program was presented by guest faculty Jeffrey M. Marks, MD, FACS, FASGE Professor of Surgery and Director of Surgical Endoscopy from Case Western University in Cleveland, OH.